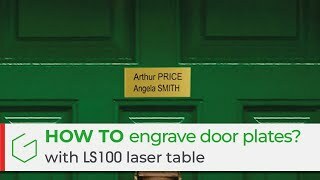 The LS100 and LS100Ex are professional CO₂ engraving and cutting solutions. The LS100 and LS100Ex are highly versatile professional CO₂ engraving and cutting solutions. As a result of Gravograph's know-how and market knowledge, the LS100 and LS100Ex solutions provide their users with complete comfort and efficiency. They fulfil their needs: from the simplest personalisation to industrial engraving and cutting work. With a handy integrated exhaust system, the LS100 and LS100Ex solutions are renowned for their reliability and robust nature, and meet the brand's quality standards. Laserstyle™ software allows fast-paced work. The advanced features simplify specific engraving procedures (barcodes, photos, dials, multi-plates, rubber stamp wizards, etc.). Definition, storage and use of engraving parameters at the click of a button! Their external accessibility and capacity for communication with graphic software applications make them a unique additional tool for controlling engraving and cutting lasers. The Print & Cut solution in LaserStyle ensures precisely cut printed products, without the need for additional materials. The LS100 and LS100Ex are easily installed in an industrial or commercial environment or even in an office setting. Their ergonomic design and their features make daily use simple and straightforward. The external accessibility and the front loading mechanism provide hassle-free loading and changing of parts. The backlit marking table allows you to see your work clearly. Thanks to an embedded dashboard, the operator can modify the job, fine tune the settings and thus avoid the loss of valuable time. To improve performance, the LS100 and LS100Ex can be adapted to different materials such as acrylics, plastics, coated metals, natural materials (paper, wood, leather, etc.) and soft materials (foam, rubber). A vast range of accessories are available for these solutions, which ensure quick and easy adaption to the users' varying job conditions. Laserstyle™ Graphic operates as standard, direct control driver. Operates in a Windows® environment.